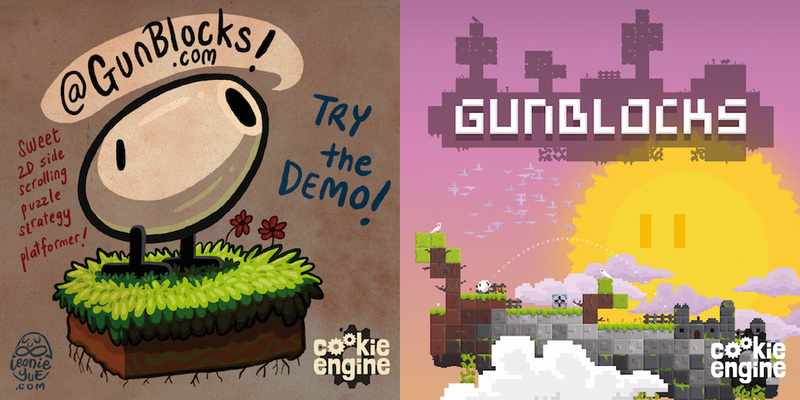 GunBlocks is a round-based platform adventure set on a mysterious blocky planet. Thanks to your incompetent team, a gluttony captain and his little stinky pet, your ship crashed and now you have to find a way to repair it. The task is not easy since an ancient force is guarding the planet. To win, you have to wisely manipulate your surrounding by placing or destroying blocks. But don't worry! You're a freaking gun and you can shoot! And even better, an over-friendly Super-Computer with a short-circuit in his emotional chip, will help you on your journey. This fabulous adventure will be available on PC, Mac, and iOS/Android Tablets. 16th Jul 2014 - Hello there! We're only few days here at tigsource, but we love it already! We received already lot of valuable feedback here. Thank you very much! The gun at the bottom is the Rookie. He's basically the gun doing all the job, being pushed around by the commander and captain. For example, when everyone has a drone to fly through the level, he's the guy which has to walk. His favorite quote is: "Worst day ever!" The gun right to the Rookie is the gluttony Captain of the ship. He has only one thing on his mind: Eating his beloved mustard-mint flavor chips. He would even let his pet pig fly the ship just to take a walk and get a new bag from the back of the ship (That's actually the reason that the ship crashed). Favorite quote: "Where are my chips?" The gun to the left of Rookie is the Commander, Captain's right hand. He's the one trying to keep the ship running, but at the end his main task is to repair the damage the captain and his pet are producing all the time. When it comes to doing the job, he delegates everything to the Rookie. His favorite quote is: "You managed to do this? What a surprise!" 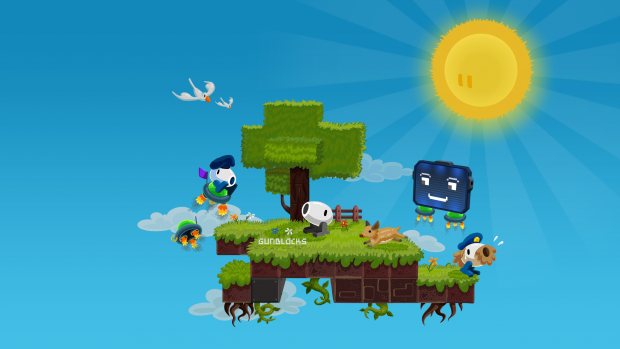 The friendly looking blue box, floating above the characters is ship's over-friendly super computer. He's following every one of Rookie's steps. Rookie thinks that he has some serious short-circuits in his brain. There are more characters in the screenshot, but they are still work in progress. We'll see how they will develop in the future. A quick experiment with PS Vita. Unity3D we love you, yes we do! I already love those characters, especially the rookie and the over-friendly computer. Hope you port the game on WiiU too ! I saw on the PlayTesting forum that your game is really fun. I'm going to try it out eventually, I just keep forgetting. Looks like an extremely interesting mechanic! How long did it take to port to vita and were there any issues with resolution? @JcttWood: Thanks to Unity3D ist was very easy to make a PS Vita build. However, there are still some issues with the rendering, which has to be cleared. Mostly related to UV coordinates. @joeyspacerocks: thank you very much! @Citsua: Hehe, Rookie and the computer are the main protagonists so far. We'll see more of them soon. About porting to WiiU: Unity3D supports WiiU too, however, we would need WiiU DevKits first. I guess this will take some time, but it will come one day. ;-) Currently we're focusing on Steam/PC/Mac. I just reviewed it in your playtesting thread. I totally dig that sun!!!! 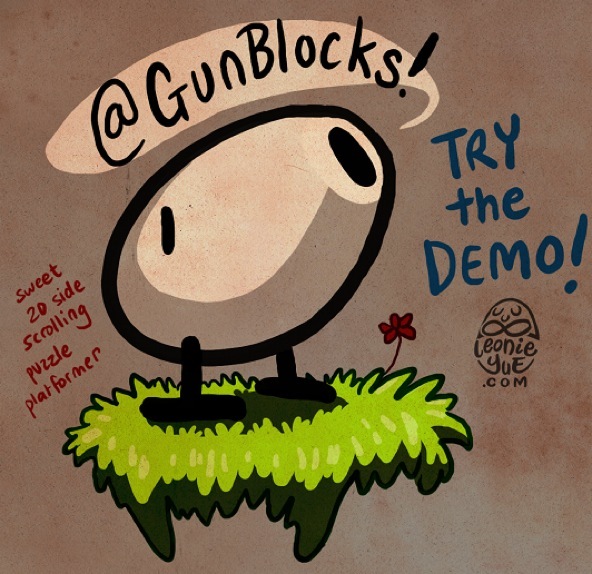 Today someone made a cool fan artwork for GunBlocks. It really made our day. Thank you Leonie Yue! Some YouTubers made a gameplay video of the game. Very interesting to see the first expression and to hear how they synchronized the characters. Nice, it's pretty cool that non-devs are looking at your game. Did you go to them or did they find it on their own? We connected somehow on Twitter, then we explicitly triggered them, asking if broadcasting about GunBlocks would fit their YT chan. Just designed a teaser for the print (10x10cm, front- and back-side). Planed to do some guerrilla marketing at the Gamescom. Let's hope it's an eye-catcher. 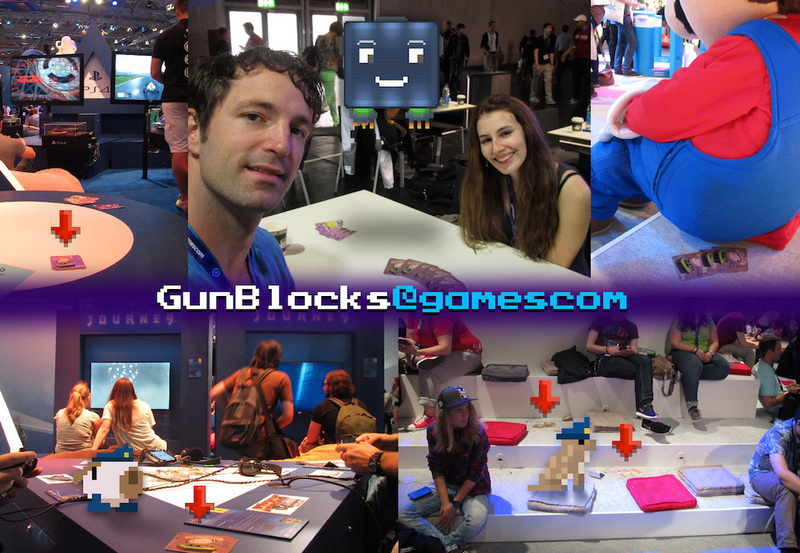 Steve and Lisa were spreading some GunBlocks flyers on Gamescom at Cologne. They really put it everywhere. True guerrillas. Sometimes, I was not able to move the bullet aim. Pressing any of the arrow didn't changed anything. It could be interesting to either be able to chose the order of the falling blocks or be able to discard a block we don't need. You can only aim when you’re in the aiming mode/turn, which is not really visible except a black flickering crosshair on your gun. We might need more accentuation for this. Regarding the discard idea, something like this will also come in the next levels. A second inventory will be introduced where you can save down falling blocks. We’ll post something about it very soon. It's been long time (120 days to be exact) since the last update. We've been rather quite recently, but it doesn't mean that we didn't work hard on GunBlocks. 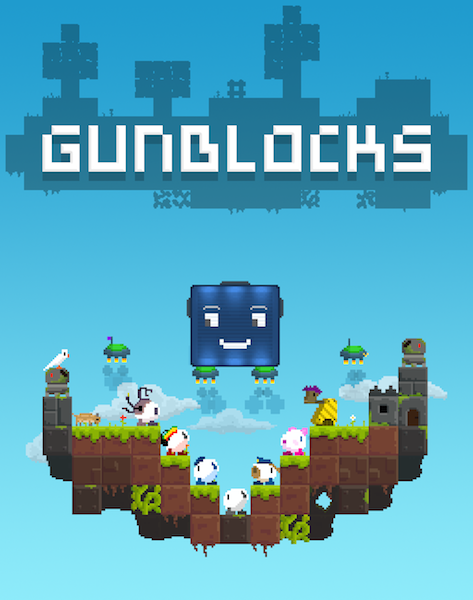 We'll be presenting more soon, but so far the new GunBlocks wallpaper. Also available as ZIP Download for different aspect ratios.